Ankles sprains and broken ankles occur when you step awkwardly on the inside or outside of your foot, causing your ankle to strain at an unusual angle. The fact that these injuries share similar causes makes it difficult to determine if you are dealing with a sprained broken or sprained ankle. A sprained ankle can range in severity from microscopic tendon tears to complete ruptures. If you are able to put weight on the ankle immediately and for several hours after the injury — and if you aren’t experiencing severe pain on the top and sides of the foot — you are more than likely dealing with a sprain. Rest the injured ankle. 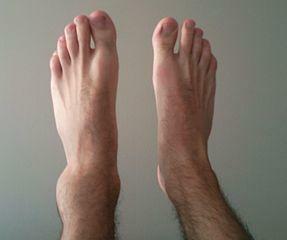 Continued strain put on the ankle can worsen and prolong the sprain. Ice the injury in order to reduce swelling. Using a towel as a barrier between the ice pack and skin, apply ice to the affected area three times a day for 10-20 minutes. Compression around the injured area helps to decrease swelling. Monitor the tightness of the compression material and adjust immediately if it gets too tight. Elevate the injury, keeping the ankle level with your heart anytime you are sitting or lying down. Take over-the-counter medicines such as Advil, Motrin, or Ibuprofen to help alleviate pain and swelling. A break in the ankle bone is also referred to as a fracture. If you can’t put weight on the ankle for several hours after the injury — and there is severe pain over the top and sides your foot — you have most likely sustained a broken ankle. If you are unable to immediately get to a healthcare provider, follow the same RICE method used to treat a sprained ankle. Once you do reach a healthcare provider, a cast or splint may be be used to realign the bone. In more severe breaks, a cast isn’t enough to readjust the bone, and an operation is in order. Some patients experiencing intense pain and complications may be prescribed pain medications. Come to FastMed Urgent Care and let our healthcare professionals diagnose if you are experiencing sprained ankle symptoms or you believe you have a broken or sprained ankle. 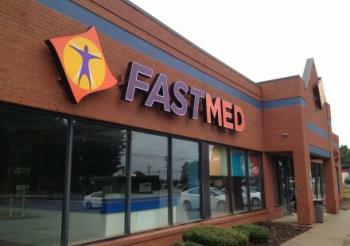 FastMed is open extended hours seven days a week, giving you an alternative to the emergency room. We offer convenient and fast care, and we have in-office X-ray machines to quickly determine if your ankle is broken. Check out our FAQ page and find out why FastMed patients are so satisfied with the quality of their care: “The urgent care center was terrific! The staff delivered exactly what I needed: professional care and personal attention – and they delivered it with care and kindness. Urgent Care is on my radar as an integral part of my community and I have given several enthusiastic recommendations to friends and work associates. Thank you!” – Gayle C.